A disability charity has been criticised by disabled activists for ploughing its resources into an “embarrassing” and “hypocritical” new campaign that has cost nearly £1 million. Scope released a series of six comic sketches, produced in conjunction with Channel 4, which dramatised some of the embarrassing reactions and comments that disabled people have had to face in their daily lives. Scope claimed that the message of its “End the Awkward” campaign – which is in its second year – was “straightforward”, and aimed simply to encourage non-disabled people to get to know disabled people. The six short films – presented by disabled presenter and journalist Alex Brooker, who was paid for some of his work, although not by Scope – secured widespread publicity across mainstream media, including slots on Channel 4, Channel 5 and ITV, and an article in The Independent. The films also won support on social media from a string of disability organisations – most of them, but not all, organisations not led by disabled people – such as Shaw Trust, Ataxia UK, Turning Point, Leonard Cheshire, Muscular Dystrophy UK, and the British Association for Supported Employment. But that support was followed by a substantial backlash from disabled activists. Many criticised the campaign’s confusing message, and questioned whether “ending the awkward” was really the most important issue facing disabled people. 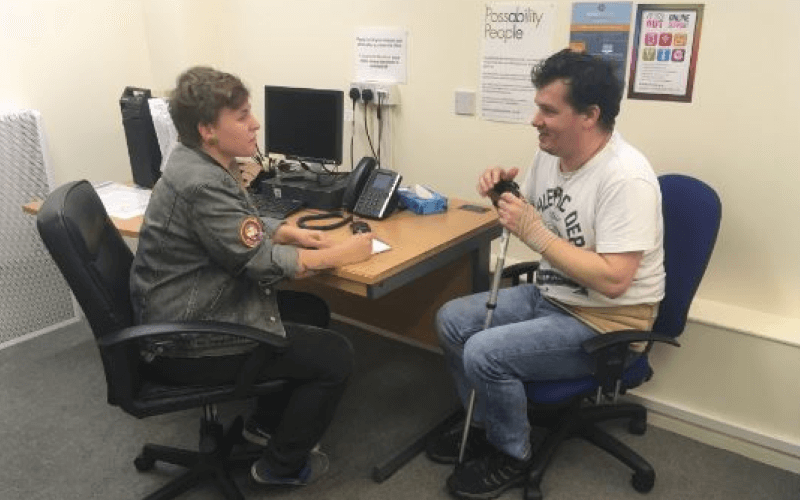 Brian Hilton, campaigns officer for Greater Manchester Coalition of Disabled People, said: “I am staggered that Scope are continuing to run this campaign for a second year, and can only wonder how they settled on this as the issue they want to plough their time and resources into. “With disability hate crime on the increase, the closure of the Independent Living Fund, the bedroom tax, the assisted dying bill, the cumulative effects of cuts on disabled people and the vilification of disabled people in the right-wing press, why is Scope still banging on about ‘End the Awkward’? Bob Williams-Findlay, a former chair of the British Council of Disabled People, described the campaign as hypocritical and “patronising middle-class pimping”. He said: “I think it’s awkward when in the 21st century there is still a charity producing embarrassing crap on behalf of people capable of doing a better job. He has spoken previously of attending a residential school run by the Spastics Society – the charity that was later renamed Scope – and has criticised the charity’s discriminatory history. Lorraine Gradwell, former chief executive of Breakthrough UK, another influential figure in the disabled people’s movement, said: “‘End the Awkward’ neatly ignores the pressing matters around disability such as social security, housing, and hate crime. “Scope have got everything wrong with this campaign, treating people’s attitudes to disability as if it were just a matter of good manners, when in reality it’s often about blatant discrimination. And Dr Theo Blackmore, an independent researcher, said that Scope had been founded by the parents of disabled children and had always been an “organisation for disabled people, not of them”, with fewer than one in five of their staff disabled people. He said: “In fact, I would suggest that Scope is an organisation for the parents of disabled children. “There is a big gap in the market for such an organisation, whereas there are lots of major national organisations that do not employ many disabled people and are run ‘for’ disabled people. “This is a very paternalistic model for organisations that should employ a majority of disabled people, while also being governed by us through their management committees. In a statement, a Scope spokeswoman said this year’s campaign had “cost just under £1 million”. She that disabled people had been “actively consulted and involved in the creation and refinement of this campaign at every stage”, while the stories the campaign was based on were “real, and told to us by disabled people”. The spokeswoman said the charity had worked with leaders of disabled people’s organisations, as well as disabled and non-disabled people from “a wide age range [and]from different backgrounds”. She said Scope was running the campaign because “many disabled people tell us that while their aspirations are higher than ever, public attitudes to disability continue to be an issue in their everyday lives. “Our ads may be light-hearted, but they address a serious issue – the way that society treats disabled people. “We want to build on this conversation about awkwardness to influence politicians, policymakers, and public opinion on key issues like increasing the disability employment rate, independent living and reducing the extra costs disabled people face. She added: “Hate crime and real discrimination against disabled people are unacceptable and unfortunately continue to happen in 2015. “We campaign on these issues and support other charities’ campaigns on them. We don’t want to make light of them. She said the campaign reached 24 million people last year, while “81 per cent of people we polled said their attitude toward disability was different as a result of watching the adverts”.